International School Ho Chi Minh City (ISHCMC) opens the new academic year with renovated learning areas in their current campus located at Vo Truong Toan Street, District 2. ISHCMC’s brand new state-of-the-art Secondary Campus is due to open in the 2017/18 academic year. In addition to this, the school has also committed to a refurbishment to the current campus, soon to become the Primary School Campus after the Secondary School transitions to its new facility. The Primary Campus Refurbishment Plan commenced in 2016 with the development of new learning areas and breakout collaborative spaces for Grade 4 and 5 students. In addition, primary students also welcomed a new makerspace and green room designed to inspire and develop creativity and innovation skills. The recent summer vacation has seen the second phase of this renovation project completed in which the Information and Media Center, previously known as the Library was relocated and received an entire makeover. Plus, new learning spaces for Grade 2 and Grade 3 classes featuring large collaborative corridors and learning lounges to facilitate group study and self-directed learning were created. The new Information and Media Center is a unique space for primary-aged children. 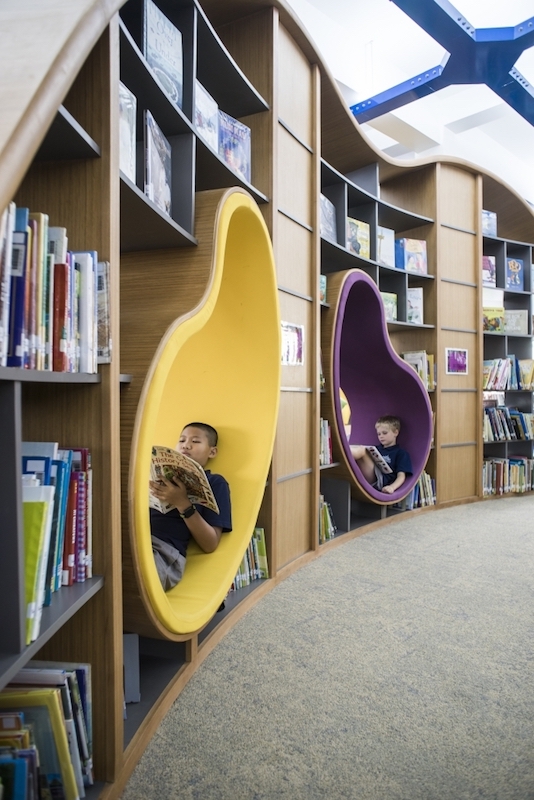 Offering more than just books, this new area encourages reading, self-study and teamwork with specialized areas such as individual inquiry pods, study pods and collaborative zones. Partnered with multi-purpose tiered landscapes that boast seating areas, storage and book shelves to ensure differentiated spaces. The area has been designed to ensure study areas that allow connectivity and can also be moved and recreated swiftly and with ease to enhance investigations relating to units of inquiry. A serpentine feature wall allows for multiple experiential spaces while a bean bag wall allows students to have flexibility and ownership of the areas.